I spent this past weekend visiting my brother, who made the choice to not eat meat (beef, pork, poultry) about ten or so years ago. He does eat a range of fish, but based his decision (among many others) partly on the current puppy mill-type factories most farm animals are churned out of. To put a small aside in, sometimes I think its funny that some of my friends (who know me and my propensity towards meat) are surprised I have a brother who doesn't eat meat. But in another light, we're just taking different routes that stem from the same basic belief. I feel that since an animal died for us to eat, we should respect that sacrifice and consume it head to tail, from its face and tongue to the various organs that get overlooked for skeletal muscle. He, on the other hand, simply abstains from a system that often barely respects the animal at all. Ultimately, it comes down to a feeling that we need to better understand where our food comes from and the true cost associated with that process. Anyway, while my brother was faced with a Sunday full of work, I elected to get dinner on the table and set myself to a day of light labor in the kitchen. At the market, I planned to do something with fish, but everything looked limp and gray, thawing out on the ice since Thursday. But next to the salt cod in the ice cooler I saw some very nice wild smoked salmon in little vacuum pouches. It wasn't lox, but the small, hot-smoked fillets often flavored with Cajun spice rubs, lemon pepper, etc. That's when I got the idea to do entree-sized stuffed mushrooms. What I settled on was two 5" portobello mushroom caps. I stemmed them and scraped the gills out with a coffee spoon. I lightly scored the bottoms to let excess moisture seep out, then salted and oiled the caps. They roasted for 20-25 minutes at 350 until the were softened and let off a good amount of their moisture. I filled the caps with a layer of black beans I'd previously boiled. I love using beans, but so often the canned varieties taste mealy straight from the can. So I simmer them for 5 minutes to even out the texture. Then I spread a layer on the mushrooms, and topped this with 4 oz of black peppered wild smoked salmon I'd flaked with a fork and mixed with watercress (leftover from our salad), a minced garlic clove, just a bit of olive oil to keep everything moist, and a tablespoon of flour to bind everything together. I found a small wedge of aged Spanish Mahon cheese in the crisper drawer, which I used to garnish the top. 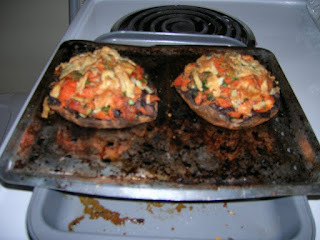 Baked at 375 for 5-7 minutes, the stuffed mushrooms came out hot, crispy, and wonderfully autumnal. 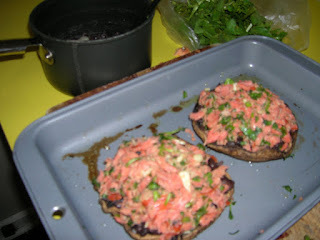 The smokiness of the salmon was a perfect way to enrich the meaty, full flavors of the portobello and black beans. You just got a bit of cutting bitterness from the watercress, accented with a bit of garlic for good measure. This was just as satisfying as any braised beef stew and something I'd enjoy recreating in the future.